Today is our 36th anniversary–3 dozen years! It’s been quite the journey, and we couldn’t be more grateful to God who has made it all possible. In 36 years we’ve learned about what marriage is and what it isn’t. If it were possible, we would love to have you over to our home, put on a pot of coffee or hot tea and sit in our kitchen talking about what we’ve learned all these years. We would love to help you see the big picture of marriage and not just what you’re facing today. We would love to encourage you on all the reasons it’s worth the effort. But this isn’t possible. So, we’ve decided to do the next best thing–have you fix your own beverage of choice, find a comfortable seat and listen in as we share with you what we’ve learned in the hopes of helping you stay the course for a lifetime. At the end of this post we’ve added a form we would like for you to fill out. We started collecting the anniversary month and years of our readers. We believe each anniversary is to be celebrated, for it’s proof that marriage can and does last a lifetime. 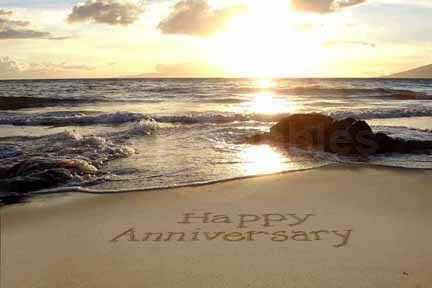 Won’t you take a moment to share your anniversary with us? And then, follow us on Facebook where each month we do a shout out to all the couples celebrating their years together that month. It’s a small way to make a big statement–Marriage Works! It isn’t a place for selfishness to grow. It isn’t two separate people co-habiting. It isn’t something to take lightly. It isn’t easily disposed of. It isn’t permission to treat another in an unbiblical way. It isn’t the place where you can share your thoughts without regard for how it will affect your spouse. It isn’t a relationship to be shared with another. It isn’t an inconvenience when the road becomes difficult. It isn’t about your happiness only. It isn’t for the immature. It isn’t for trying it out to see if it works. It isn’t for the children alone. It isn’t a bond that should ever be severed, unless in the case of unfaithfulness or abuse. It’s a covenant between one man and one woman to live together for the purpose of procreation and to honor and glorify God. It’s a mirror of Christ’s love for the church. It’s knowing you have a partner to help you navigate every road life sends your way. It’s being committed to one person more than anyone else you know. It’s being known fully and knowing another completely without shame. It’s learning to be transparent in all areas–no secrets. It’s having someone who will pray for you as if their life depended on it. It’s covenant–a promise made to God before witnesses that you are in this for the long haul. It’s a privilege to be named among those who have gone before you and make your mark as to what marriage looks like to all those coming after you. It’s a responsibility to be faithful to every word you said on your wedding day. It’s a duty, but one that brings the most delight. It’s friendship in the truest sense of the word. Having a friend who loves you for who you are, not what you do. It’s being sexually active with one person for as long as you both shall live. It’s enjoying being naked and not ashamed. It’s believing the best about your spouse, even when they’ve let you down. It’s helping your spouse believe the best about themselves when they’ve forgotten. It’s making plans for the future and allowing each other to dream big dreams. It’s having a family together and raising them in the knowledge and fear of God. It’s making the most of the time we’ve been given in life in ways that count for eternity. It’s where the miracle happens–two people become one. This entry was posted in Celebrations, Christian Marriage, Growing Strong Marriages, Purpose, Seasons of Life, The Gospel & Marriage and tagged Anniversary, wedding anniversary, What marriage is, what marriage isn't. Bookmark the permalink. Reblogged this on The Fragrance of Marriage!.